View of 9th Street Market from second story window. 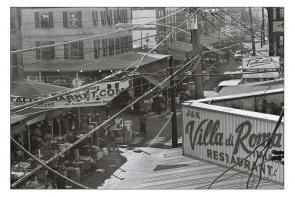 Villa di Roma sign in foreground and 9th Street Italian Market banner hanging above street. Maria Petrone: "Villa di Roma Restaurant in the foreground, family owned and operated for about 100 years by the De Luca Family, view from 9th and Montrose looking South on 9th street. When I was a kid growing up about 40 some years ago, the Market was filled with predominantly Italian Vendors selling produce, imported Italian specialty food shops and some Jewish fabric and clothing shop owners. I shopped here almost daily with my Italian Immigrant grandmother for that night’s dinner. It was a bustling market, alive with color, sounds and smells, some good, some foul (in the summer time while the garbage was waiting for pick up)."